In 1943, the West Point basketball team, the Cadets, had only managed a 5-10 record, and for the 1944 season coach Ed Kelleher's hopes in reversing Army's fortunes rested on his five starters. They consisted of three seniors - team captain "Big Ed" Christl, John "Three Star" Hennessey, and class president Bobby Faas - and two juniors, Dale Hall and Doug Kenna. At the academy, Kelleher molded his cadets into a new kind of team, and, as the new season opened in January of 1944, Kelleher's strategy paid handsome dividends. By the end of January, West Point was 6-0; by the end of February, the team boasted a 13-0 record. Of course, during those weeks, it only took a glance at the newspaper headlines to be reminded that there were far bigger contests than intercollegiate basketball afoot in the winter of 1944. 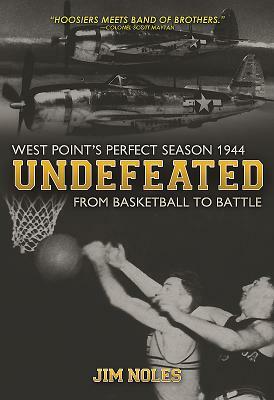 In the years that followed, the Army's basketball team would never again have a chance to play in the NCAA tournament and, in the modern era, few remember West Point's perfect 1944 season. Although West Point's home basketball court is named the Edward C. Christl Arena, and the National Invitational Tournament's trophy is named after his coach, Edward A. Kelleher, too few people fully appreciate why. But after reading Undefeated, they will.